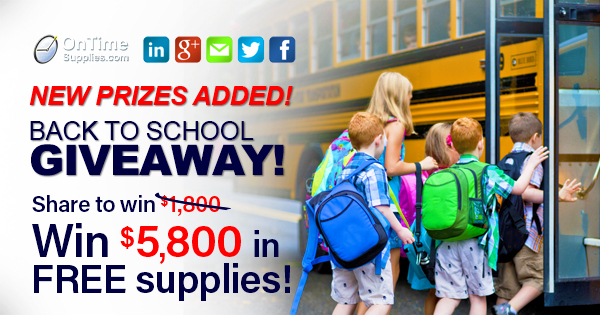 How to win $5,800 in school supplies. You get one entry per subscription and share. For five entries and five chances to win, subscribe to the blog and our mailing list, then follow us and share the giveaway on all four social networks. My favorite student is Hailey Helms. She never ceases to impress me! I’ve shared this contest on Twitter & Facebook. Thanks for putting together such an awesome giveaway!!! I would donate this to the elementary school .5 (1/2) block from my house. I have retired from working in a public school but still hold the children dear to my heart. EEECK! I forgot to read the instructions correctly. My favorite teacher is Sharon Samuelsen Sweeney of the 6th-grade class here at Valley Falls School. With her help, I would get all the supplies to the correct administrative person for the school! I would be in grateful tears if I won..lol The school just barely managed to avoid a county-wide consolidation this year so funds are super thin and many people made sacrifices to assure we kept the school local and class sizes small! This would help tremendously with my three grand-babies’ school supplies. I take care of all 3 of my grandbabies on my disability check without any help so this would really pick up the slack! My favorite teacher is Mrs. Gloriano. She always helped me, answered my questions, and made me very comfortable in science class. Couldn’t ask for anyone better. Love you Mrs G!! Single mom of 8….would be a great help…. Shared on Facebook… And best teachers.. To many to name… Sandra millward.. Ali millward…. Susan kellam… Beth Smith… Mrs. Arnold.. Ms. Pop. @ashleymillerbg shared retreated on twitter! Thanks for a have to win much needed a singlr mommy! @ashleymillerbg shared re tweeted my favorite teacher is.Mrs carroll! !